Spray 10-inch nonstick skillet with cooking spray; heat over medium-high heat. Sprinkle both sides of fish with seasoned salt. Add fish to skillet; reduce heat to medium-low. Cover and cook 6 to 8 minutes, turning once, until tuna is slightly pink in center. Remove fish from skillet and keep warm. Add onion to skillet. Cook over medium-high heat 2 minutes, stirring occasionally. Stir in orange juice; cook 2 minutes. Stir in dill weed, butter and orange peel. Cook 1 to 2 minutes or until slightly thickened. Serve sauce over fish. 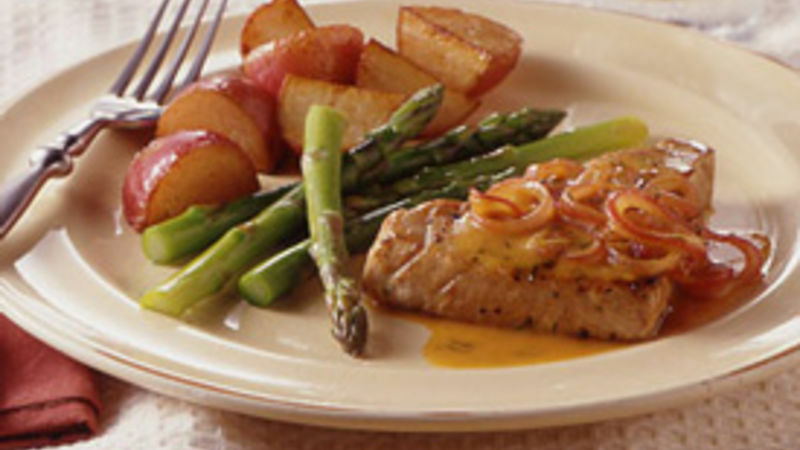 Fresh asparagus and lightly buttered new potatoes complement this citrus-flavored fish. For an easy yet elegant garnish, use orange slices and dill sprigs.